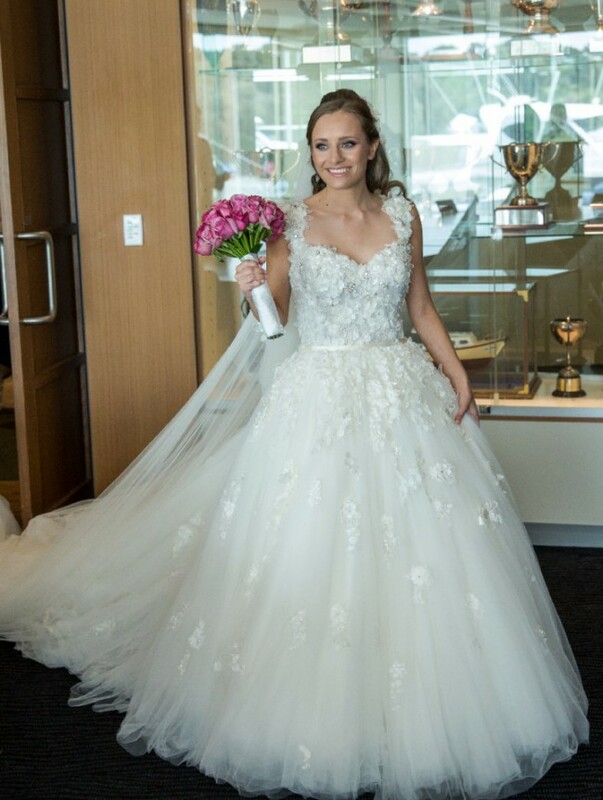 Steven Khalil Australia's leading wedding dress designer created this breathtaking custom made haute couture gown. This dress was an absolute dream to wear and very light weight. The dress has incredible detailing including pearls, beads, crystals, 3D flowers and lace. The immense detailing of this dress is simply jaw dropping. No photo could do this dress justice as when you see it in real life. I definitely received a WOW from every guest at my wedding. I would love another bride to experience wearing this dream dress. BODICE: Completely boned and fitted from the bust to the waistline. There are three different types of hand beaded embroidered French lace. The dress is fitted with a silk belt around the waist. Low V Back and in-built bra present. SKIRT: Covered in sectioned off hand beaded French lace and up to 15 layers of pleated tulle to give the appearance of fullness. TRAIN: Up to 1.5m long and can be bustled up. VEIL: The full length veil is embroidered in French lace and matches the dress perfectly. The dress has cap sleeves that could convert to strapless if preferred. Conditional is excellent with no tears. Would fit a size a 6-8. Please feel free to contact me if you would like to try on the dress or have any further enquiries. Located in Melbourne.